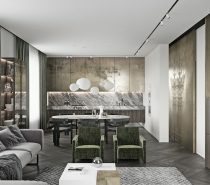 Luxury isn’t exclusive to huge scale homes, sophisticated small scale luxury is every bit as fabulous. 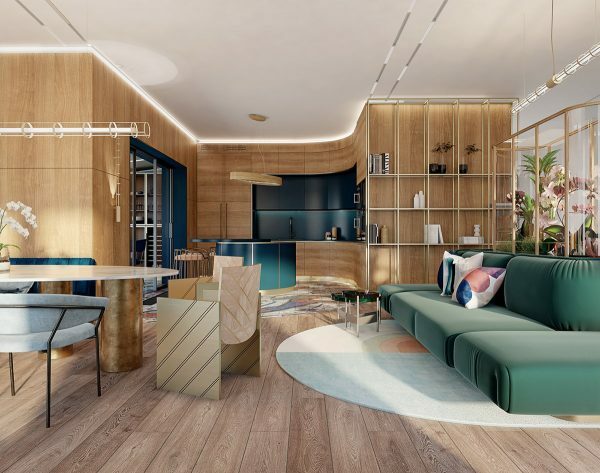 These two compact living spaces offer upscale style in spades, with the help of beautiful botanical themed decor, precious metallic accents and bold use of color. 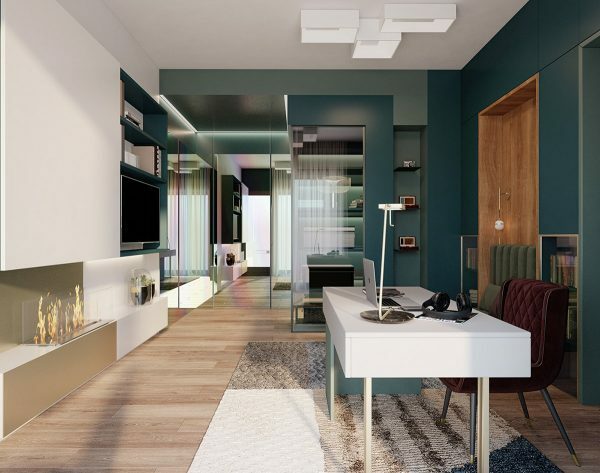 Find jewel tones and Mondrian inspired decor in apartment number one, plus a very special indoor glasshouse. 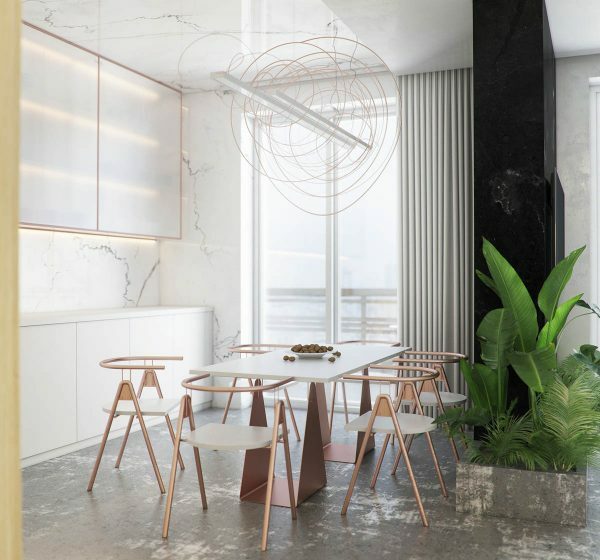 Home number two takes us on a journey of rose gold trims against refined marble backdrops that are juxtaposed by raw rugged concrete. 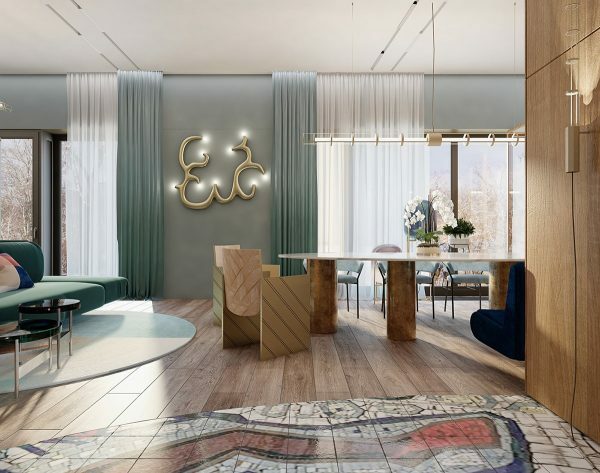 Each high end scheme is given true individuality with the help of bold bespoke furniture pieces, unique shelving and unusual decor elements that are sure to inspire. 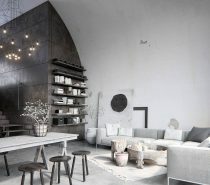 The indoor plant house acts as a stunning room divider, softly feathering the view through the open plan room. Golden framework edges the curvaceous glass enclosure. 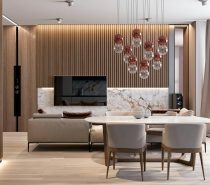 Our first apartment interior was designed for a young family, located in the residential complex Rublevo Park. 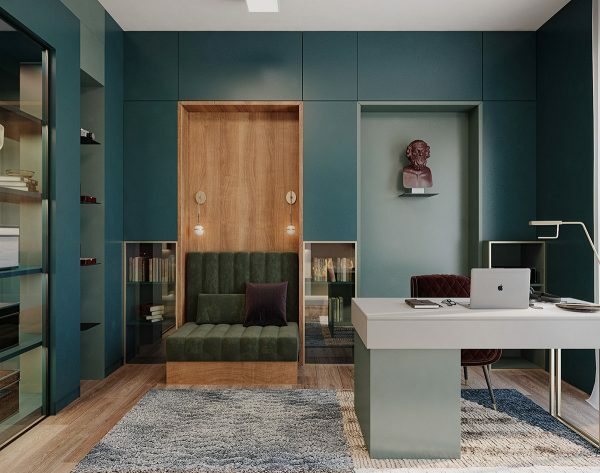 Soft grey painted walls and wall mounted cabinets create the backdrop for a large emerald coloured sofa arrangement. 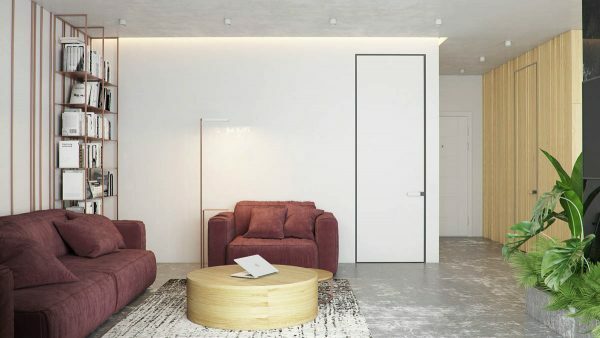 Each sofa faces out toward the four walls of the room, creating a rectangular void at the heart of the cluster. The void is filled by a small but sleek glasshouse for a variety of plants. 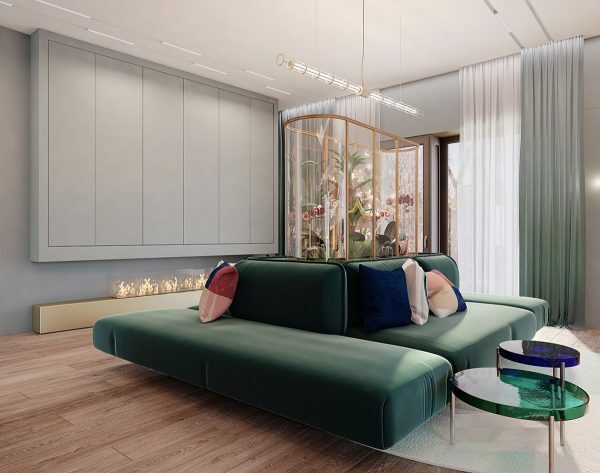 A golden hearth supports a modern fireplace below the TV. 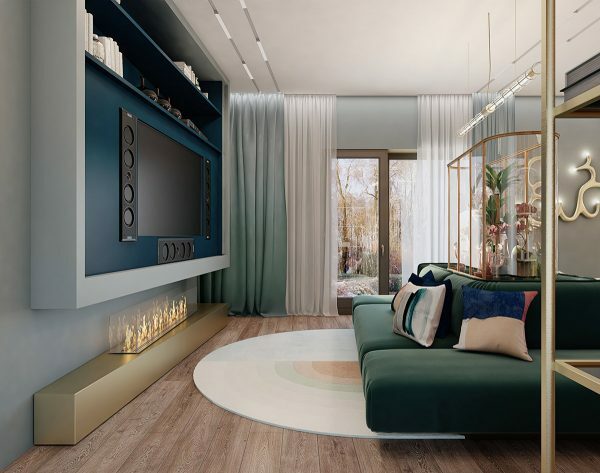 The flat screen television is recessed within a blue surround, which incorporates a series of bookshelves and sound speakers. A half circle rug peeps out from under the comfortable seating. The opposite side of the sofa arrangement is faced into the dining room, with another half circle rug at its foot. The blue and peachy tones in the rug design match with accent cushions on the green sofa. A golden wall light scrolls in organic form between the windows, against pale green paintwork. Matching curtains and sheer white voiles dress the windows. 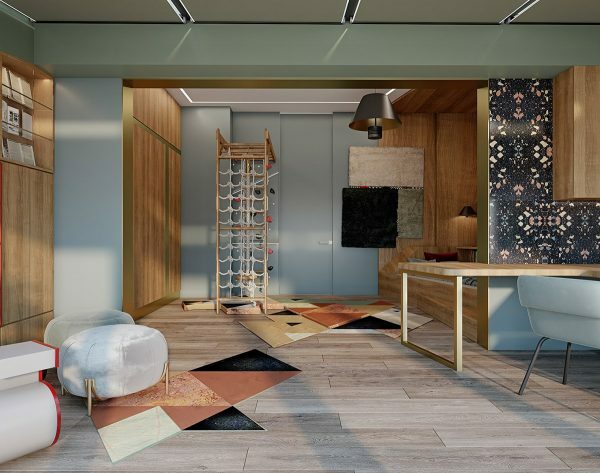 The wooden flooring in the living room is carved away to meet with a tiled floor, decorated in muticolour organic design. The luxury dining set is made up by contrasting styles of dining seats in blue and gold. 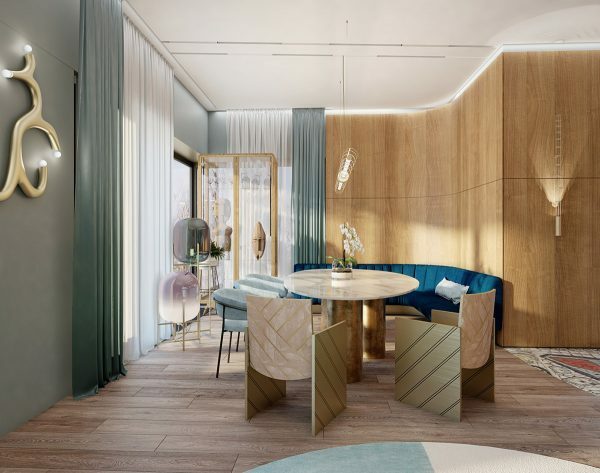 A blue banquette bench skims a curved wood panelled wall. 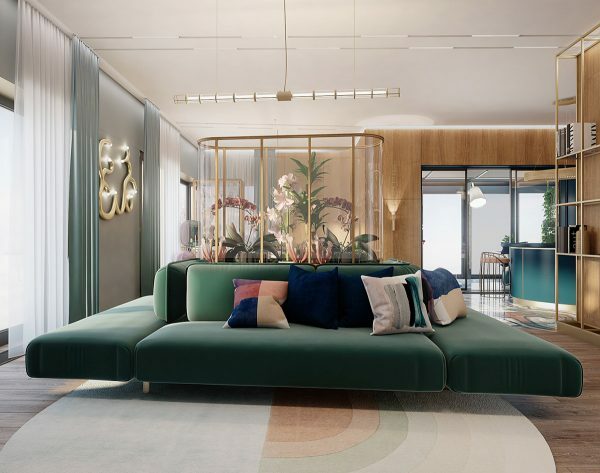 Iridescent floor lamps add to the colourful ensemble; these are the Oda style lamp. Originals are available here. Jewel tones shine from nesting coffee tables in front of the sofa, in sapphire blue and emerald green. In the kitchen, a curvaceous blue island and backsplash break up a wall of wood grain. 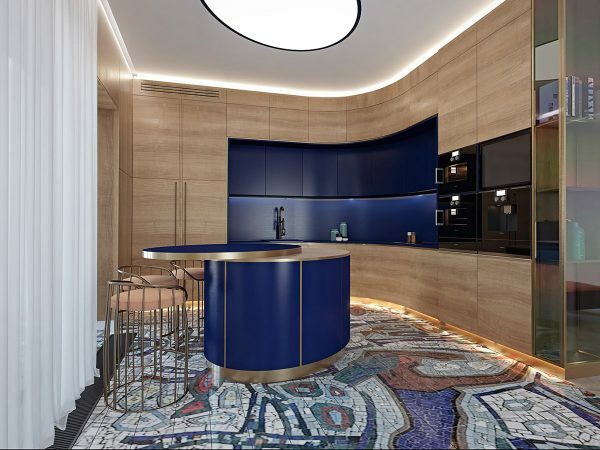 The royal blue kitchen island has a unique design, as if it were a pretty presentation box with its lid slid to one side to form the breakfast bar. 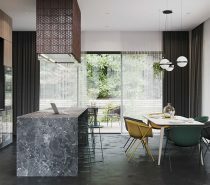 Three unusual kitchen bar stools nestle beneath the overhang. Behind the kitchen bar stools, a third dining/coffee area is fashioned inside of an orangery. 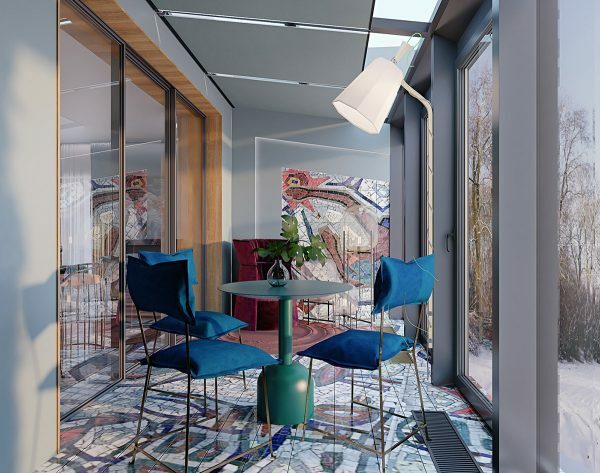 The mosaic effect floor tile continues out here, where it is also framed against the wall as art. 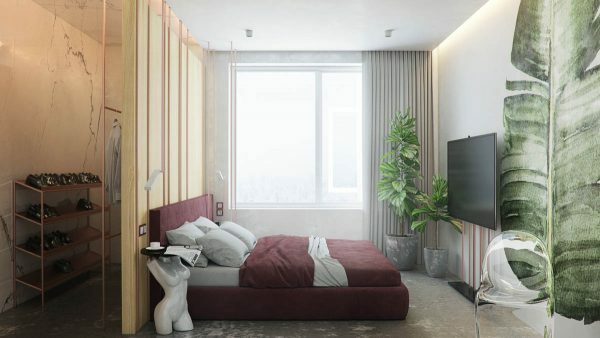 Inside the master bedroom there is a very unusual platform bed design that incorporates seating. 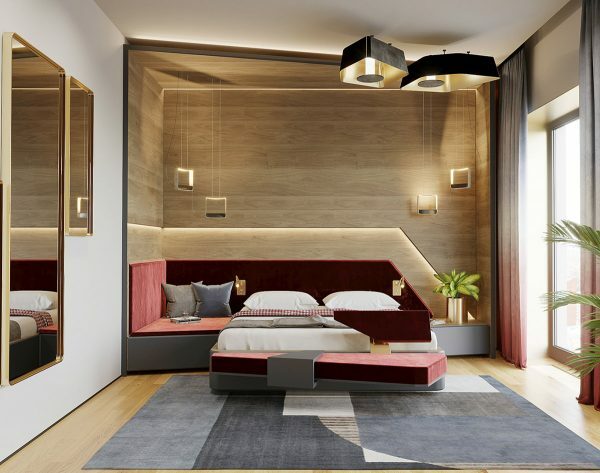 An angular bench with backrest cantilevers from the foot of the bed, and the bedside doubles as a cosy seating nook with cushions. 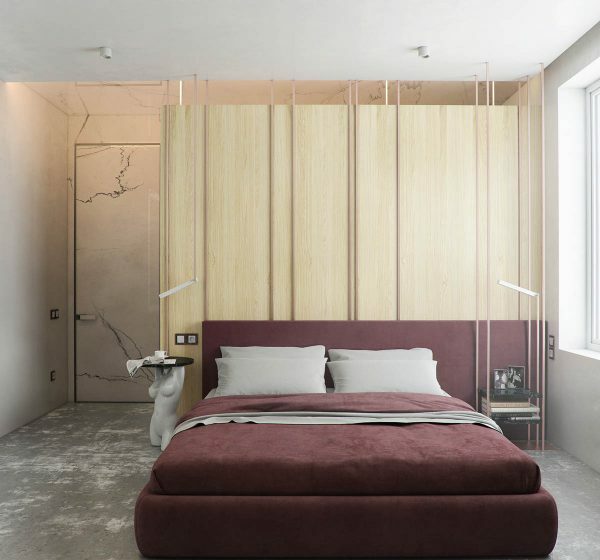 A series of bedroom pendant lights illuminate the creation. 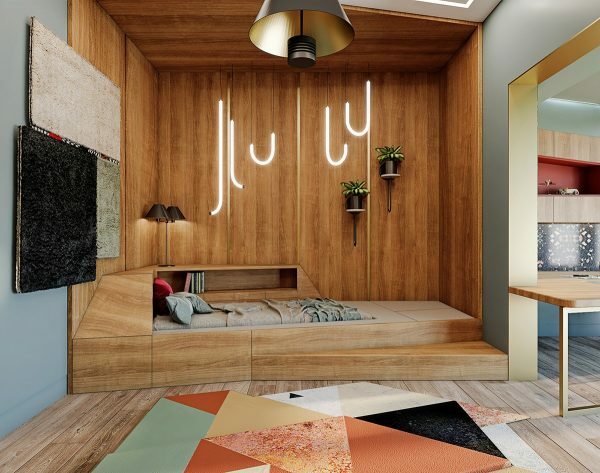 A section of the wood effect headboard wall is cut away and fitted with LED strip lights to create a layered effect. Ombre window drapes are tipped with red to match the bed upholstery. A green indoor plant creates strong contrast. 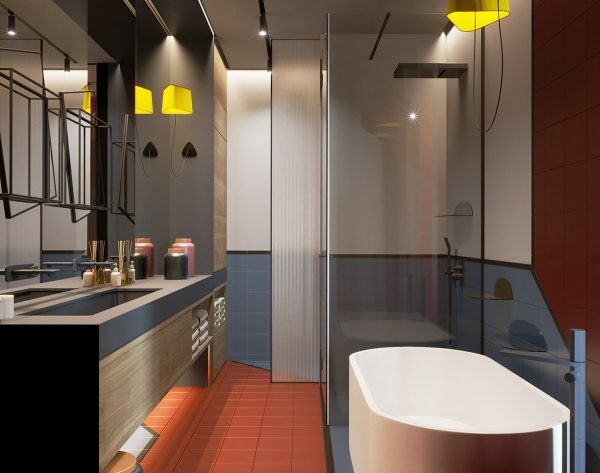 The red accent colour continues inside the luxury bathroom, in a Mondrian inspired interior design. 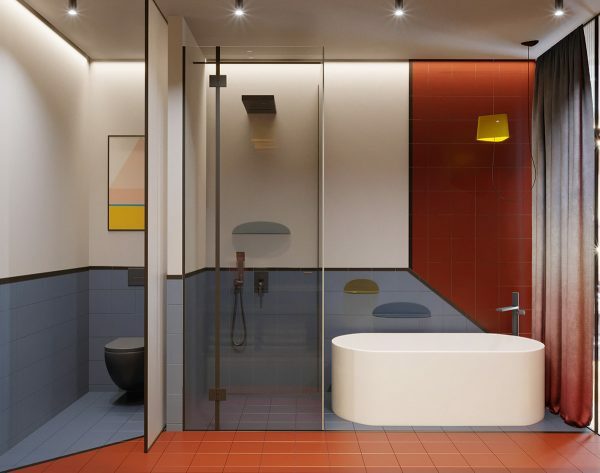 Red and blue bathroom tiles are contained within a dark outline to replicate De Stijl. 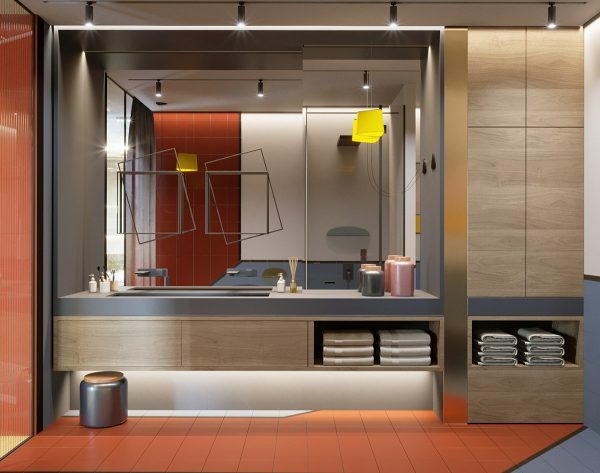 The bathroom wall is divided into three volumes: the bathing area, the shower cubicle and a WC enclosure. 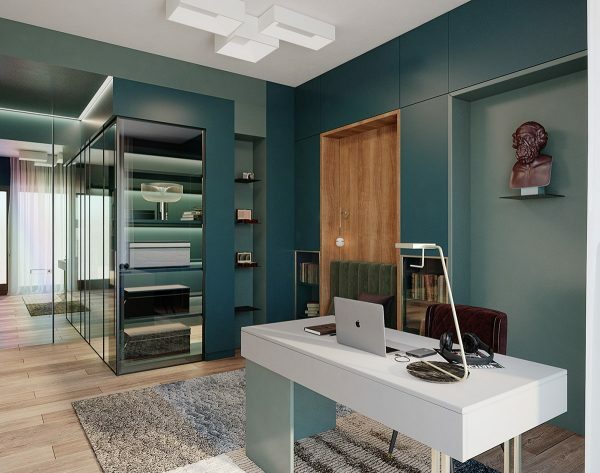 There is a modern home office through a set of glass sliding doors. 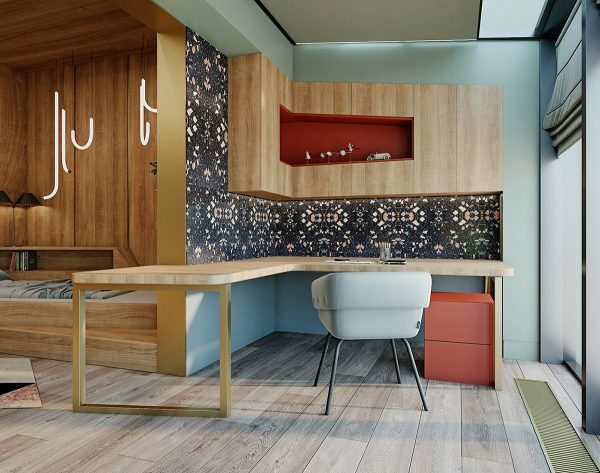 A contemporary fireplace flickers in front of the work area. A reading nook has been built into the storage cupboards, with glass bookcases on either side. 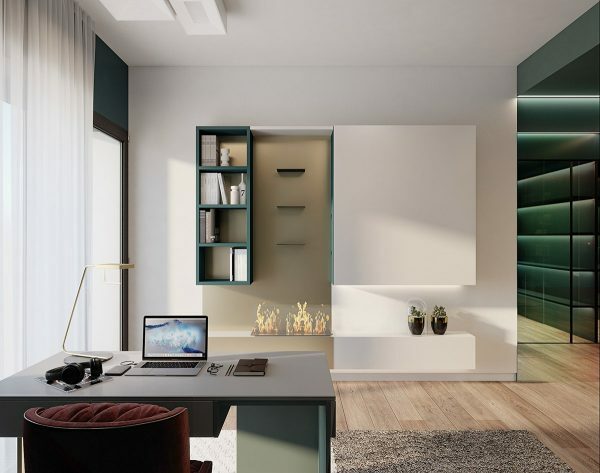 The modern home office desk is colour coordinated with the walls, with one leg finished in pale teal. A sleek table lamp lights the desk. More unique table lamps here. 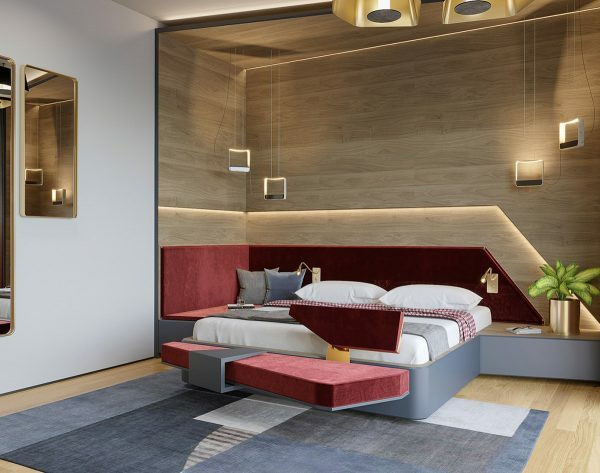 The kid’s bed is another bespoke design with angular cuts and and integrated features. 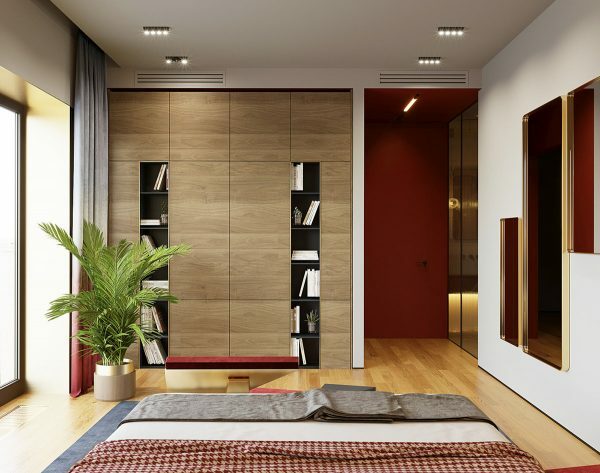 This time a bookcase is built into the wood surround, and a triangular step climbs the edge of the platform. Geometric mats colour the floor. 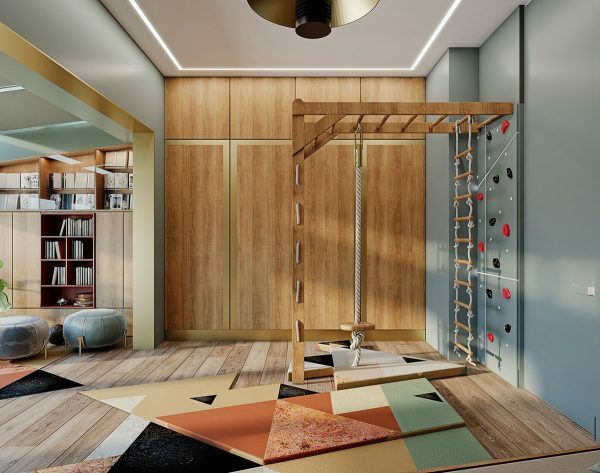 The kid’s study offers up more bespoke angular inspiration. Floor mats become thicker around a climbing area to provide a softer crash landing. 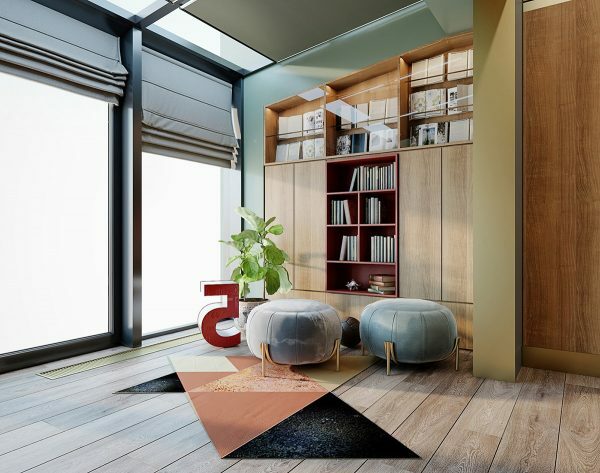 A couple of pouffes huddle around a bookcase to offer a comfy reading spot. 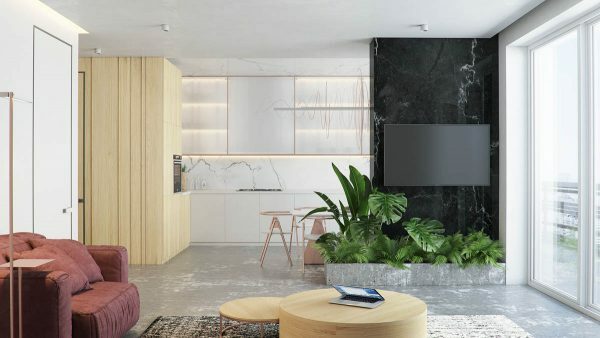 Our second example of small scale luxury is a simple but elegant apartment that combines marble and concrete, wood and metal. 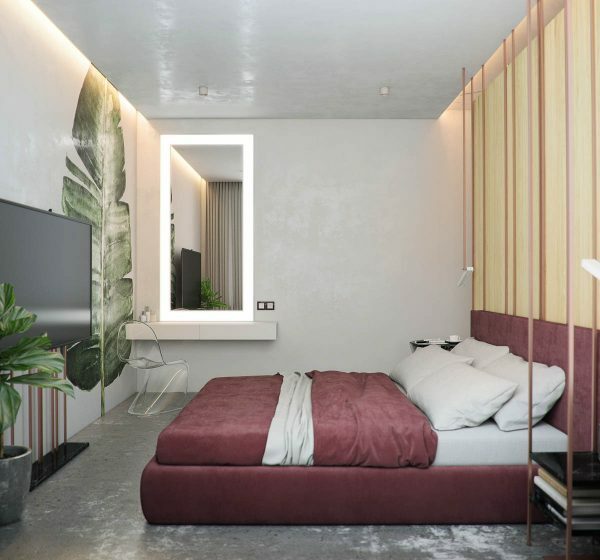 An indoor concrete planter forms part of the tv wall decor. The indoor plants make fresh colour contrast with a rouge armchair and sofa. 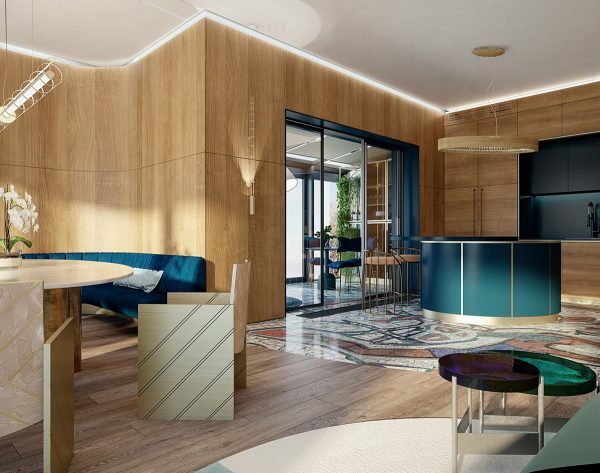 A cylindrical wood coffee table forms the centre of the lounge. 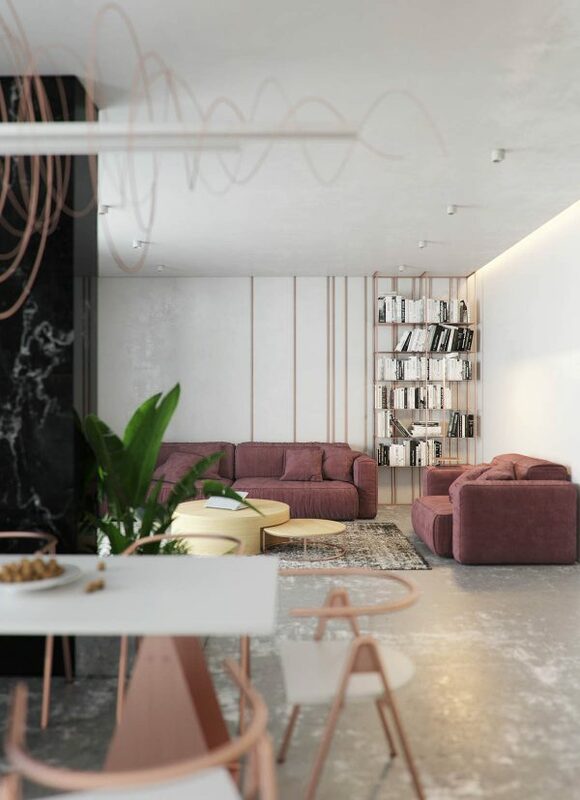 Rose gold bookshelves complement the warm tone of the seating upholstery. Matching metallic slats make up a feature wall behind the sofa. The lounge stands open to the dining room. 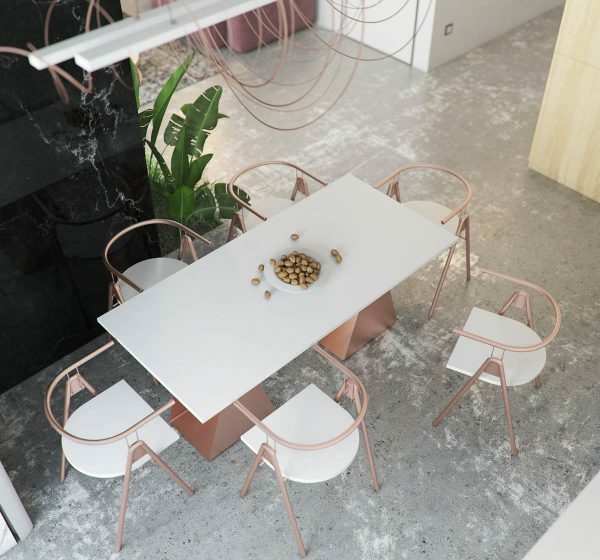 Rose gold chair and table legs look fresh combined with ice white tops. 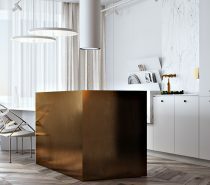 The kitchen units continue the white and gold theme. 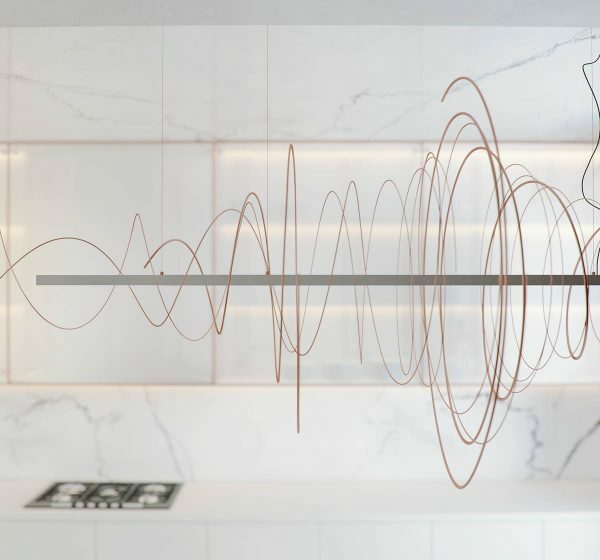 Metal wire scribbles the outline of a sculptural light. The deep colour of the sofa fabric is repeated in the master bedroom over a bespoke upholstered bed. A striking botanical mural colours the wall green, and shows through a translucent vanity chair that is a clear acrylic Panton S chair. Living plants join the botanical theme. 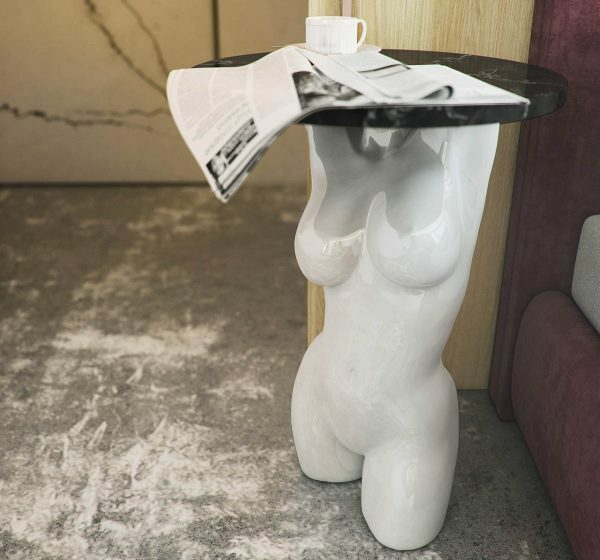 A sculptural bedside table holds the morning paper and coffee. 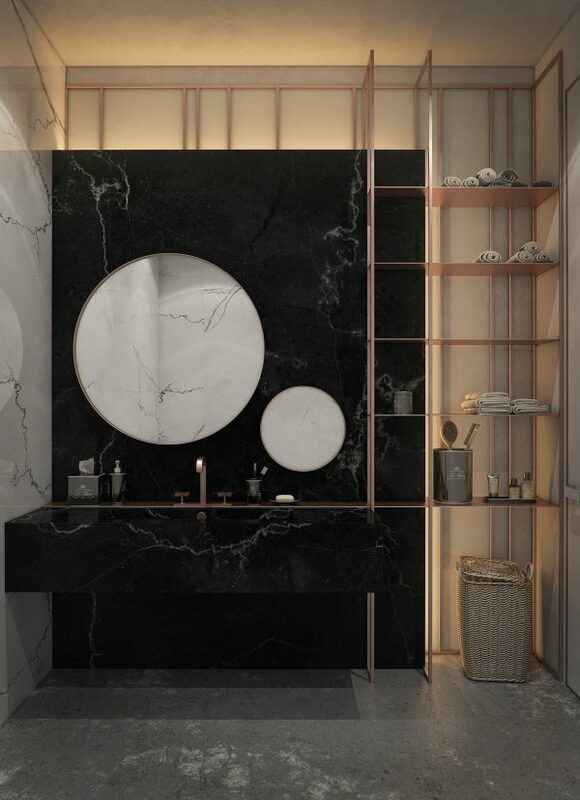 Rose gold enters the bathroom in the form of an open shelving unit, a unique faucet and two round vanity mirrors. 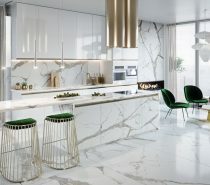 The shining metal sings against a monochrome backdrop of luxurious marble, and a cool concrete floor.